The aluminium sector is the world’s second largest metals market, with a total market value around £45 billion. Demand continues to increase for aluminium in several sectors, including the automotive sector where reduced weight is significant for emission control. Aluminium is a feasible option for specifiers across a broad spectrum of sectors due to the rising prices of alternatives such as copper and zinc. Although moderate output cuts have seen prices begin to increase slightly, stockpiling and oversupply have kept the prices of aluminium low. By 2025 global demand estimates are for approximately 40 million tons of aluminium production, which would require 230 million extra tons of bauxite to be extracted and processed. According to analysts emerging economies, such as China and India, will be the main reasons for the increased demand for aluminium. The production forecast for 2016 is 59 million tons, with a slightly higher consumption. Nevertheless, prices are likely to stay low, even as low as $1,400. There may be an increase towards the year end. According to the International Aluminium Institute (IAI), in the first seven months of 2015, global aluminium production averaged at around 158,000 tons per day (tpd) compared with 143,300 tpd during the same period in 2014. In June, Chinese production dropped to 87,871 tpd from 91,867 tpd. A long-term decrease in the Chinese output is likely to be the main reason behind the type of supply deficit, which would have a real impact on the stock load. Demand for aluminium is likely to remain robust, as it is still a metal with one of the highest growing demand profiles. India accounts for 8% of global aluminium production currently. Aluminium is widely used in the country’s automotive sector, and recycling is rapidly growing. The fast growth in the automotive sector has resulted in an increased focus on quality, especially in the area of castings. The need to reduce costs, by decreasing total cost of ownership, is a further result of this rapid growth. China produces 43% of the total global aluminium production, making the country the largest single market for aluminium in the world. However, it is still a net importer as it consumes 44% of the total aluminium used globally, regardless of it not being a market-driven economy. The Chinese economy’s quick growth has led to substantial overcapacity, as well as construction of several new smelting facilities, some of which are agglomerated. Another factor is the government’s decision to start to remove all higher polluting and less economical facilities. In the recent years the automotive sector, which had previously grown rapidly, has slowed. Prices have declined, partially because of overcapacity and surplus domestic stock levels, however recovery is underway with some smelters back on-line. The production of high-purity aluminium is an increasingly significant area for use in the electronics sector. Although growth in this area has reduced a little, demand is strong for technologies and products. An increasingly vital factor is energy, and demand is increasing for consumable products to contribute to decreased usage. China's exports of unwrought aluminium and products have decreased. One of the reasons is the lower premiums and high prices. If the exports from China do not rise, the rest of the world could find itself in a shortage, which will help decrease stockpiles. However if prices rally due to lower exports from China, its exports may pick up again. Possibly the most stable of the current key aluminium markets is EMEA. One key development is the increasing co-location of facilities for primary and secondary processing, in order to decrease transport and storage costs and to benefit from economies of scale. More than anywhere else quality is the chief driver, to ensure that useless gas is eliminated from the process, and in terms of purity of the casting regarding its metal content. The need for quality applies to both primary processes, where the benefits of achieving greater quality at the first melt stage are being investigated, as well as the secondary aluminium sector. The necessity to minimize energy usage in the Americas is not as obvious as in other parts of the world, due to more frequent use of gas-powered heating with gas produced from fracking. The market is growing, including in the secondary aluminium sector, where the need for longer-lasting and quality consumables to increase productivity is behind many innovations being brought to market. The goal is to decrease the total cost of ownership of production consumables. The final product quality has usually been the goal of secondary aluminium processors, however primary aluminium processors are increasingly driven to gain a competitive advantage through improved production quality. Consumable suppliers are realizing that their products have to be approved by OEMs, producing better co-operation with machinery manufacturers at the component design stage. A constant driver is price, and falling prices have left some smelters uncompetitive. An additional effect of the continued cost pressures is on the receptiveness to modify within the sector. Traditionally there was a loyalty to tried and tested methods, products and processes. It is now more accepted to use alternatives in the area of consumables, especially if the products service life can be extended, reducing the need for frequent maintenance, decreasing energy usage, and lowering the total cost of ownership. In the automotive sector decreasing vehicle weight remains paramount for component development and design. Aluminium continues to be the feasible option in relation to the cost of ownership, compared with many other lightweight alternatives. The current consumable innovation and supply is prompted by the requirement of better energy transfer and improved finished product quality. Aluminium furnaces use a large amount of energy and there is a need to maintain a constant temperature to improve quality, so efforts to reduce energy loss during the melting process are welcomed. The need to meet the stringent global and local safety regulation relating to insulation of materials is also important. In previous years refractory ceramic fiberboard was considered the industry standard, however there is a concern that it possesses carcinogenic properties, and it is being banned in many places. This led Morgan to develop low biopersistent fiber-based alternatives, introduced in the late 1990s. To meet the growing process requirements, recent innovations have acheived better insulation and higher melting points. They are practical for the aluminium sector as they possess temperature resistance of up to 1,200°C (2192ºF). These materials are offered in board and blanket forms, making them appropriate for applications in casthouses, potlines, and anode bake ovens. They also possess key features such as low shrinkage, which is lower than 1% at 700°C (1292°F), and compression. Solutions to match individual application requirements are attainable, including; duration of exposure, operating temperature, compression, environment, single or multiple usage, amount of handling, installation technique, and airborne fiber exposure. Recent tests performed at the most standard operating temperatures for furnace back-up board - between 600ºC (1112ºF) and 800ºC (1472ºF) - indicated that in the main area of thermal conductivity, the advanced low biopersistent fiber-based board was far better than calcium silicate by an average of 20% at 600ºC (1112ºF) and 15% at 800ºC (1472ºF). Block products form insulation layers in aluminium reduction cells to reduce thermal conductivity, which is no higher than 0.16 W/m.K at a mean temperature of 900°C (1652ºF), and offer excellent dimensional stability and hot compressive strength, and better cryolite resistance. Thickness shrinkage reaches a maximum of 2.8% at 1,100°C after 24 hours of soaking, with linear shrinkage under the same condition no more than 1.8%. Morgan Superwool fiber is also offered in felt, modules, paper, and custom shapes. The company has specialized material for caster tips. 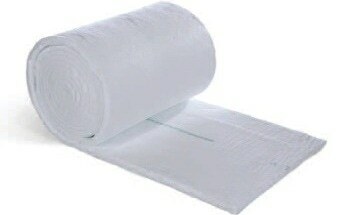 It also supplies seals, gaskets, thermal covers, furnace cones, and flexible launders. The following tables list the properties of Morgan’s products. In melt-hold furnace lining, continued investment for the improvement of monolithic materials provides better quality and productivity. There are a number of issues relating to these furnaces, as each area of the furnace has several requirements, such as temperature, flux contact, metal contact, and thermal shock factor, which means that suppliers will have to provide numerous products with varying performance features. For example, products used on ramps have to provide high resistance to thermal shock, abrasion, aluminium, and alkalis (Figure 2). Morgan’s latest products possess abrasion loss as low as 2.8cm³ at 815°C (1499°F), which is much lower than similar products in the market. The products possess a pick-up of 0.011% at 1,000°C (1832°F) over 100 hours, over 10 times lower than that of the closest competing product in the market (Figure 3). With belly bands, the highly aggressive metal-to-air interface ensures resistance to alloys and salts, as well as aluminium, abrasion, and thermal shock. 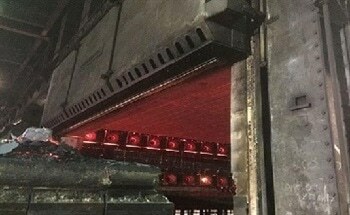 The superstructure, jambs and lintels, lower walls, burner blocks, and back-up lining all have individual requirements, and testing is complex as several industry standard test conditions rely on lower temperatures and operating times, and the tests do not truly indicate how operators utilize their furnaces. The ideal method, to guarantee that a product is appropriate, is to examine it under real operating conditions. There is continuous optimization of advanced products, and the exact combination is not always simple to realize, but it is key to enhance productivity and performance and decrease energy usage. The secondary aluminium processing sector relies on quality, which is inextricably linked to purity, particularly in high-specification applications in industries such as electronics. The presence of gas, especially dissolved hydrogen, is one of the main sources of impurity and physical deformations, which led to performance and strength issues in cast aluminium parts. Adequate degassing technologies are crucial to production. It is important that the removal of gas from the area of production is matched with inertness to the presence of molten aluminium and an extended service life, as reactions with the aluminium will produce impurities and the possible loss of the cast product when it undergoes machining. Morgan’s new degassing rotors are made using silicon carbide, a high-performance and cost-effective substitute to conventionally used graphite material. Previously graphite was the most widely used material to degas rotors, but frequent changeovers and high replacement costs have reduced their demand. Compared to graphite, silicon carbide has superior anti-oxidation and wear resistance properties. This means that the new rotors are able to work five times as long as graphite-based rotors - one experiment revealed that over 800 cycles of usable life in a heavy fluxing application, compared with an average of 300 for graphite products - and they are made using an isostatically pressed, single-piece design. The rotor head has been improved to decrease bubble size and provide optimum gas dispersal via a smart six-vane design. During testing, the new rotors revealed considerably lower oxidation levels compared with graphite products, whose degassing performance deteriorated when head geometry became deformed. Melt densities with the silicon carbide rotors remained higher for a longer period than with graphite products. The primary aluminium sector also utilizes degassing technology. Compact in-line degassing rotors are used to process molten aluminium via rotating nozzles directly in the casting trough between the casting pit and furnace. These products contribute to advancements in the total metal quality, safety, and productivity, as well as decreasing maintenance and operation costs by up to 60%. The need for expensive thermocouples and heating elements is eliminated. There is no need to remelt aluminium or to maintain molten aluminium between casts in the degassing chamber (Figures 4 to 7). Aluminium casting could be contaminated through the crucible in which the aluminium is melted. Fragments can break off or melt from the crucible, especially in older products, when exposed to the high operating temperatures and fall into the molten aluminium, ruining the purity, and leading to poor casting quality, which may not be discovered until the last minute. The crucible’s composition can also cause contamination. When crucibles are modified at timed intervals, instead of on the basis of actual wear, the effects can be highly detrimental. Morgan have developed a series of specialist coatings as a solution to the issues above. The coatings can be used on a variety of crucibles with varying performance attributes, based on usage temperatures and preferred performance. For example, coatings made using Al2O3 play an important role in reducing dross adhesion and restricting metal contamination at temperatures of up to 1,600°C (2912ºF). Other Al2O3 based coatings offer the same performance in very high purity applications. Special glaze formulations can be applied where alloys using several fluxes are processed. This helps to decrease the impact of flux on the crucible material. All three coating types are well-established, and are now combined with a new technology to push the performance boundaries even further. Boron nitride coatings can provide a reduction in excellent dross adhesion and restrict contamination in very high purity applications (e.g. 5N and 6N Al) and can handle temperatures of up to 1,000°C (1832ºF) (Table 4). STAR Coating - New product: Applications and advantages are still being explored. The international aluminium market is estimated to stay afloat for the next couple of years at least. This is due to the number of new applications, particularly high-purity ones, its versatility, and the high prices of several of its alternatives. Most regional markets are committed to growth, and are looking to coordinate with consumable partners to deliver solutions that can assist them with productivity and quality, while decreasing emissions and energy usage. The exploration of smart materials technology and design, and the growth of currently available technologies will continue to generate new opportunities for suppliers capable of delivering responsive and quality service. This information has been sourced, reviewed and adapted from materials provided by Morgan Advanced Materials. For more information on this source please visit Morgan Advanced Materials.